According to research by Ambi-Pur, bad household odours affect how we feel about our homes, what we cook, and whether people will visit us or not. In the survey, 57% of women mentioned that they have avoided visiting someone else’s home because of a bad smell and have gone on to comment about this to others. While 78% of women believe that a bad smelling home is a reflection of the host and 66% of women feel that a bad smelling home is a reflection of an unclean home, when asked who was responsible for the bad odours in their homes, the survey participants pointed the finger at their pets, children and partners. In my house, I can only point fingers at my cats who sometimes pee indoors. We’re way past the nappy stage, otherwise that would probably be a culprit. The survey revealed the worst household odours that women experience in their own homes included bathroom smells (toilet and napies) followed by the smell of garbage, cigarettes, cooking smells (especially fish) and pets. Musty smells ranked highest as the toughest household odours to get rid of. Interestingly 87% of South African women said they mainly use air fresheners in their bathrooms, but believe other smells found throughout their homes to be the toughest to get rid of. 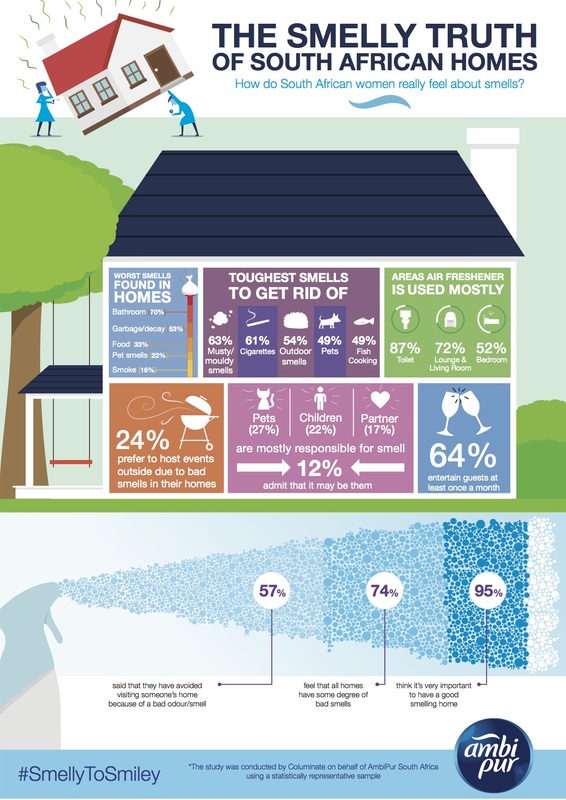 Below is an infographic with the research findings – I was most interested in the stat that 24% of South Africans entertain outside because of smells in their house. Surely in most cases a spritz of freshener would eliminate the bulk of these smells? Pleasant fragrance spray can help your home feel friendly and welcoming. Wipe your pets’ feet: If you aren’t into keeping a towel by the door to wipe off paws, try a plush mat or rug outside your door to help catch falling debris before it ends up around the house. Mom of two, writer, runner and lover of tech, Paris, sneakers and reading.